Vitória - ES, Brazil. The university, UFES, is the large green area at the bottom. Inside UFES, in front of the PPGFis building. Cosmo-ufes is the Center for Astrophysics and Cosmology of the Federal University of Espírito Santo (UFES). It is a center for research and science outreach. Grad school: Cosmo-ufes members are coordinating the new International PhD program on Astrophysics, Cosmology and Gravitation PPGCosmo, and are also members of the graduate program in physics of UFES (PPGFis). Cosmological surveys: Cosmo-ufes and PPGCosmo participate in collaborations such as DES, Euclid, J-PAS, Virgo and LIGO. Research grants: Besides by UFES, the group's research is funded by the Brazilian research agencies CAPES, CNPq and FAPES. ii) internal list for the cosmo-ufes members. Journal clubs: Starting on 2019, we now have three JC's: cosmology, galaxies and gravitation. 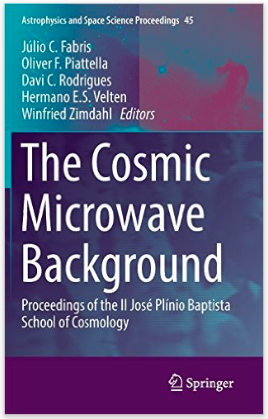 The cosmic microwave background (CMB) radiation is one of the most important phenomena in physics and a fundamental probe of our universe when it was only 400,000 years old. It is an extraordinary laboratory where we can learn from particle physics to cosmology; its discovery in 1965 has been a landmark event in the history of physics. 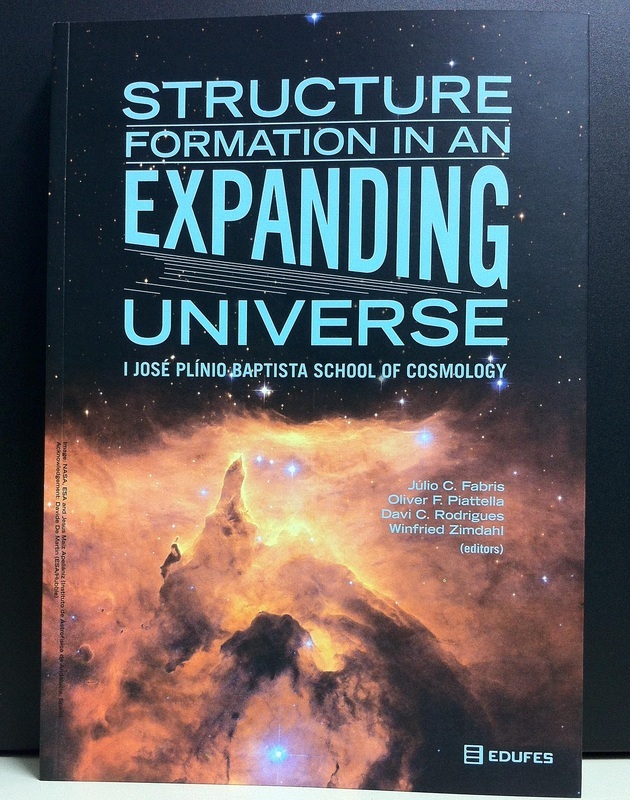 The series of texts composing this book is based on the lectures presented during the II José Plínio Baptista School of Cosmology, held in Pedra Azul (Espírito Santo, Brazil) between 9 and 14 March 2014. This II JBPCosmo has been entirely devoted to the problem of understanding theoretical and observational aspects of CMB. Editors: Júlio C. Fabris, Oliver F. Piattella, Davi C. Rodrigues, Hermano E.S. Velten, Winfred Zimdahl. 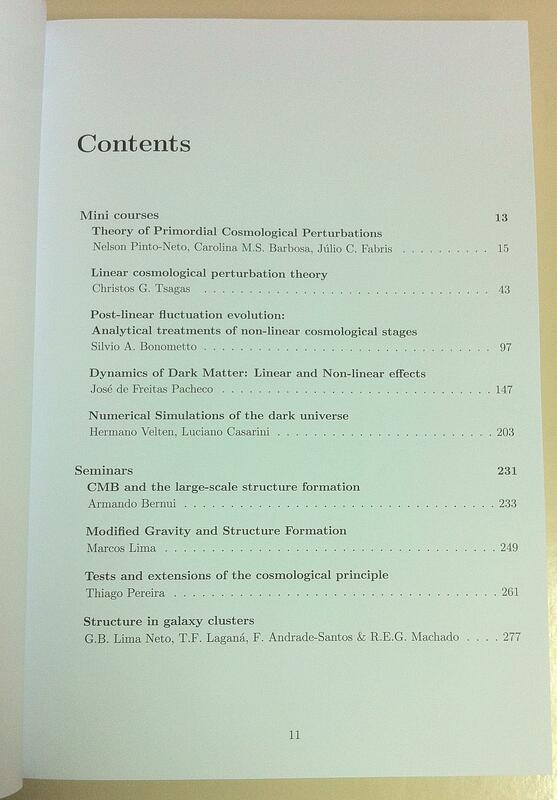 The mini courses and seminars presented in the I José Plinio Baptista School of Cosmology can now be found in book form. The standard cosmological model is based on an expanding universe which is, at very large scales, homogeneous and isotropic. However, at local, small scales, the observed universe displays very complex structures like galaxies, clusters of galaxies, filaments and voids. One of the main problems in cosmology today is to understand how these local inhomogeneities are formed out of a global homogeneous universe, the so-called structure formation in an expanding universe. The understanding of this problem requires very sophisticated theoretical and observational tools. This book is composed of a series of texts reviewing the different aspects of this problem. The presentation is highly pedagogical. 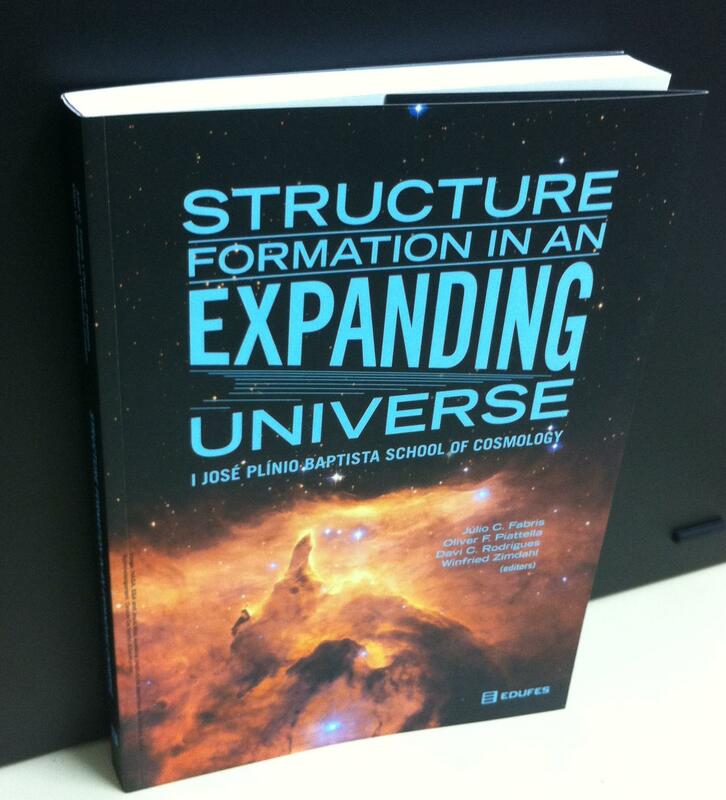 These texts have been written by specialists in the problem of structure formation in the universe. 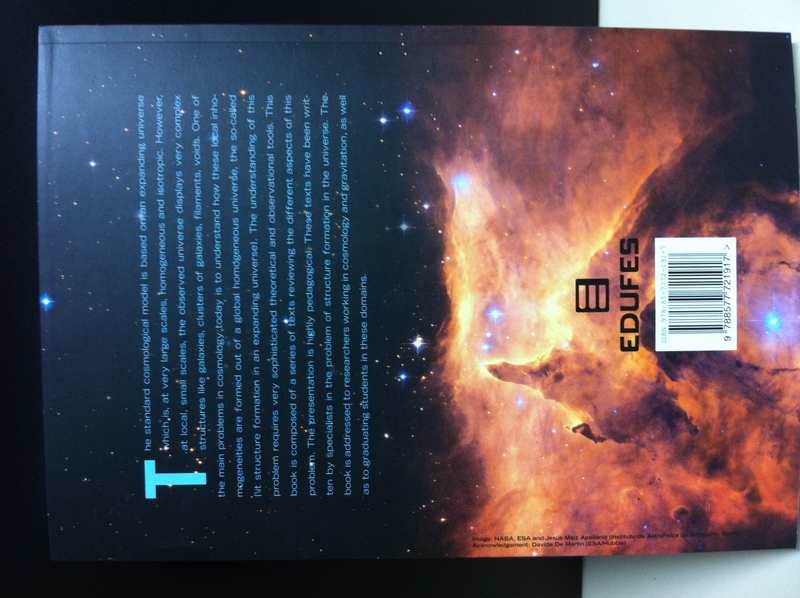 The book is addressed to researchers working in cosmology and gravitation, as well as to graduating students in these domains. To order a printed copy, please contact us. The electronic version can now be found here. Other book photos: cover 2, cover 3. D.C. Rodrigues, O.F. Piattella, V. Marra.